These are the special red cows, called Vacche Rosse, whose milk is the key ingredient for the best Parmigiana-Reggiano cheese made in Italy. Consorzio Vacche Rosse cheese factory and dairy farm near Reggio Emilia. Heather von Bargen photos. it was the most delicious Parmigiano Reggiano I’d ever had. “It’s the red cows, Vacche Rosse,.” Toni said, teaching me to pronounce the words. “Vah-kay. Row say.” He pointed his knife to a photograph of a cow in his cheese case. “An ancient breed from Emilia-Romagna, the best cheese cows in Italy.” He cut a kilo for me and gave me a brochure from the Consorzio Vacche Rosse. In 568 AD, the Lombards invaded what is now Italy’s Emilia-Romagna region, and brought Red Cows with them. 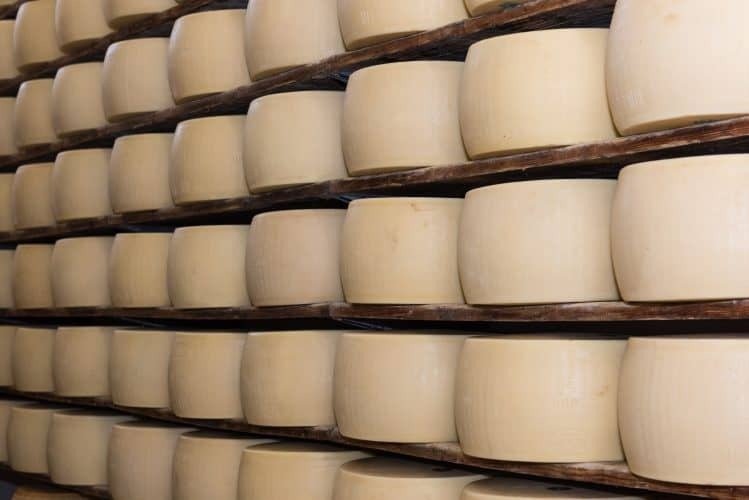 In the 1200s, Benedictine monks used milk from the Vacche Rosse to make Parmigiano Reggiano cheese. The Master Cheesemaker checks the cheese with a ladle. In the 1950s this ancient breed was 41,000 strong. Then farmers replaced the Vacche Rosse with Holstein and Swiss Brown cows. By the 1980s, the Red Cows were endangered, numbering only 450. Breeders created the Consorzio Vacche Rosse in 1991 to make Parmigiano Reggiano as the monks did, with only red cows milk. Now three thousand red cows are milked twice a day on twenty-five area farms. I arranged to visit the Consorzio Vacche Rosse cheese factory and dairy farm near Reggio Emilia. My guide Luca came to the lobby with booties and a hair cover for me to wear. He led me down a hallway to the production room where four men moved deftly among huge tanks full of milk. We passed through their activity, climbed some stairs and observed from above. One cheesemaker stirred milk with a paddle. One dipped his bare hand in milk every few seconds. “Our drivers have only two hours to collect the fresh milk in order to ensure quality,” Luca said. “Sometimes they go too fast and get in trouble with the police. The evening milk is put here,” he said, gesturing toward the now-empty basins near us. Lifting the 200-pound rounds of cheese out of the milk. A cheesemaker added whey to the milk tank nearest me. He set the temperature to 34º (93ºF) and poured in carefully measured rennet from the first stomach of a baby cow. If he made a mistake with the rennet, that tank’s milk—potentially worth 1,500 Euros—would be useless. Several minutes later, the master cheesemaker approached the tank and drew circles with his finger in the thickening milk to check the curd. He reached low into the tank, grabbed a piece of cheese, squeezed it, and then handed it to me to try. It tasted fresh and clean, lacking the salty flavor of Parmigiano Reggiano. “The salt comes later,” Luca said. The cheeses soak in brine for 20 days. hand through the milk. After a few minutes, he stirred vigorously to break the curds into tiny pieces. He tested the curds in his hand, turned on the agitator, and moved off to another tank. After these curds had cooked for about an hour, the master cheesemaker swept his arm over the surface of the milk then stuck his arm deep into the tank to check the cheese. He nodded to his colleague who lifted the 200-pound ball of cheese with a wooden paddle while the cheesemaker worked a cloth under it. They heaved the cheese up and tied the cloth to a steel rod over the tank. A different man held a large knife with both hands and cut the ball of cheese down the middle. He wrapped the two balls in cloth and put them into plastic molds in which they would take on Parmigiano Reggiano’s characteristic shape. Luca brought me to the room where the cheese is taken once out of the tank. Cheese wheels wrapped in metal hoops were lined up on tables. Luca held up a wide plastic band with raised lettering. “This is a fascera,” he said and pretend-wrapped it around a wheel of cheese. 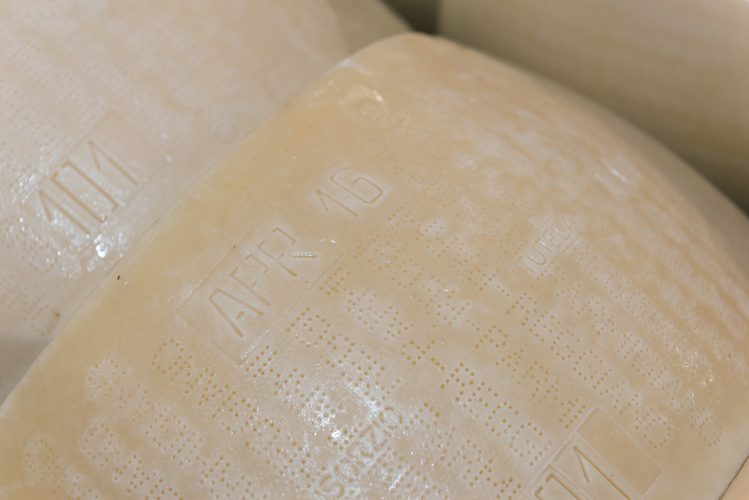 I realized that was how Parmigiano Reggiano gets its distinctive dotted imprint on the rind. Drying the cheeses before aging. The fascera is removed the next day when the cheese is put in perforated stainless steel molds to dry and take its signature convex form. Testing the cheese with a needle, the Master Cheesemaker assures that every wheel is perfect. He led me to a large room filled with shelves laden with cheese from the floor to the ceiling. Each wheel weighed 82 pounds; the wooden planks had been built to support 100 wheels. The room was cold and damp and smelled irresistible. Regular Parmigiano Reggiano is aged for 12 months before it is sold. Parmigiano Reggiano Vacche Rosse ages for at least 24 months, and for special occasions, up to 60 months. Luca pointed at a machine in the corner. 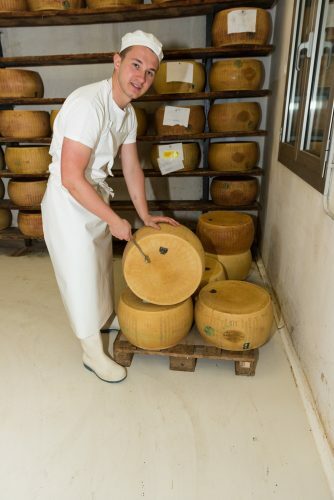 “We turn, clean and brush each cheese with this machine once a week,” Luca said. After twelve months, the Parmigiano Reggiano consortium sends an inspector to test the cheese for quality. They visually examine and smell each wheel and whack the cheese with an acoustic hammer. Luca hits cheese with a hammer to test its quality. If the sounds are consistent, the cheese has no holes. If the cheese passes inspection, it gets branded with the Parmigiano Reggiano seal. 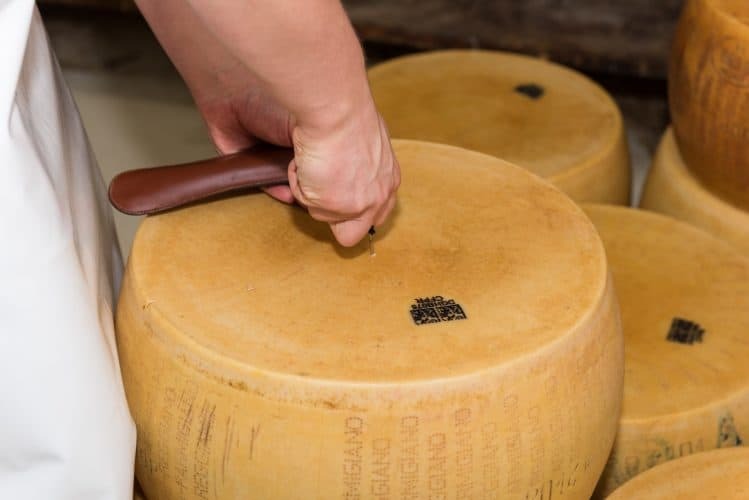 If a wheel has large holes or is too round – a sign of bacteria in the cheese – it cannot be sold as Parmigiano-Reggiano and the Consorzio must scratch the indentations on the rind. Twenty-four months after production a cheesemaker inserts a thin threaded needle in the center of each cheese and extracts a tiny sample. He smells and tastes it. Cheeses that pass are branded with the second seal of the Consorzio Vacche Rosse. The words “Vacche Rosse” etched in a circular pattern on the top of the wheel ensure that even small wedges bear the symbol. 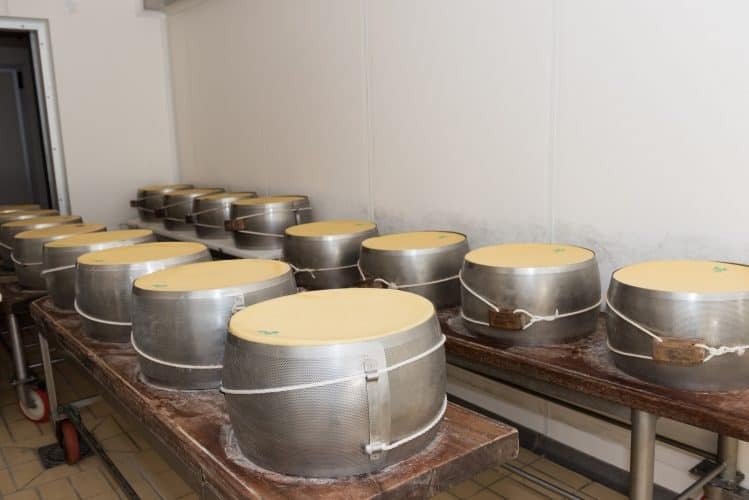 The wheels of cheese age and then will develop the crust and turn yellow. Ninety percent of the red cow’s food has to come from the Parmigiano-Reggiano region, even the hay used in winter. All of their food is required to be GMO-free. 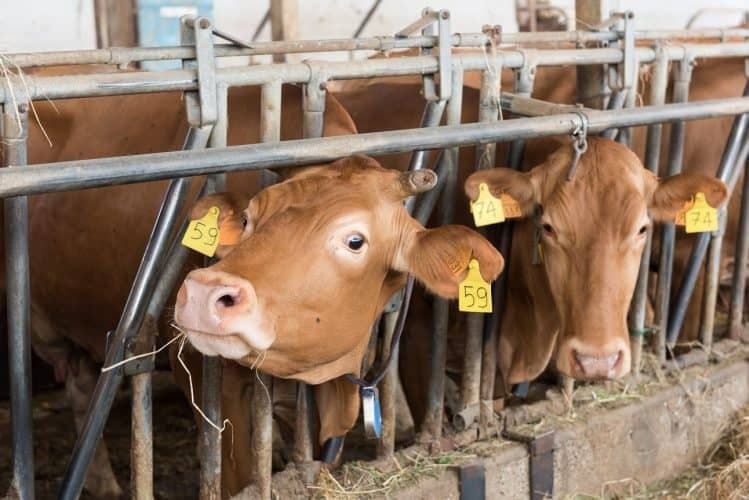 “The Vacche Rosse produce less milk than regular cows, but it is better milk because the composition of fats and proteins is better for the production of Parmigiano Reggiano,” Luca said. A black and white cow might produce 45-50 liters of milk a day. The average Vacche Rosse gives twenty. “We know from studies with the University of Bologna that these local grasses give more Omega 3 and Omega 4 to the cheese. And after twenty-four months, the lactose in the cheese is fermented by the bacteria, so the cheese is lactose-free. The cheese rind before it turns to crust, with identification of the farm and date. on my tongue and I tasted the grass I had just smelled in the barn. I bought a kilo of the thirty and the forty months, thanking Luca as I left. I was happy to have Parmigiano Reggiano Vacche Rosse again, but happier still to know the heritage of this memorable cheese and to know why it is so delicious. 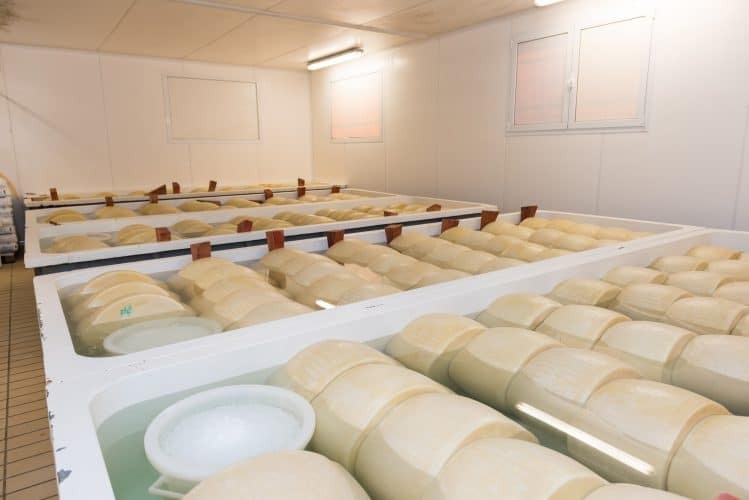 The Consorzio Vacche Rosse offers tours of their cheese factory and dairy farm in English and Italian. You can buy Vacche Rosse cheese online at www.parmashop.com . 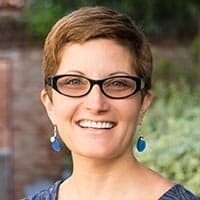 Heather Von Bargen is a Tampa, Florida-based writer and photographer who focuses on travel and all things Italian.